The Brad doll was made from 1970 to 1973 and is Christie's boyfriend, the Curtis doll was made in 1975 and is Cara's boyfriend, both dolls are part of the vintage Barbie doll friends. Both black dolls have the same size beefier Ken doll body so they can share his wardrobe. Has dark brown skin, black painted hair, brown eyes, black doll with bendable legs, talking Brad wore a bright colored multi print pull on shirt with solid color orange shorts. Same as above Brad doll with a little darker skin color. Bendable leg Brad wore solid color orange shirt and multi-colored swirled printed trunks (same print as 1124 Good Lookin' Ken 1970). Brad's head mold was used to make the Curtis doll, he has brown painted hair, brown eyes, dark skin tone black doll, otherwise is same as the 7280 Free Moving Ken doll with the free moving tab on back that allows the doll body to rotate bend or twist and the beefier body style so he can share and wear Ken's clothing. 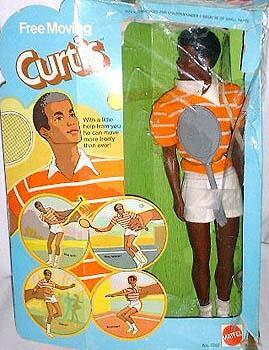 Curtis wears a one piece sport short-suit, with an orange, white stripe shirt, white shorts attached, white socks and shoes, a golf club, tennis racket and ball were included.